The first time I went surfing was in 2007 in Nicaragua and the second time was in Tofino, British Columbia, Canada. Although I’ve been surfing twice before, I’ve never managed to stand up for longer than a second or actually ride a wave to shore. Falling off the board and being dumped by massive waves was more my experience. This is probably due to the fact that I’ve never been taught correctly or taken an official lesson (or tried on not so beginner waves). I have the type of personality that if I want to try something I just go for it. Full speed ahead. In most cases, this strategy has worked for me very successfully. Surfing however, is an adventure sport that I just couldn’t master on my own. 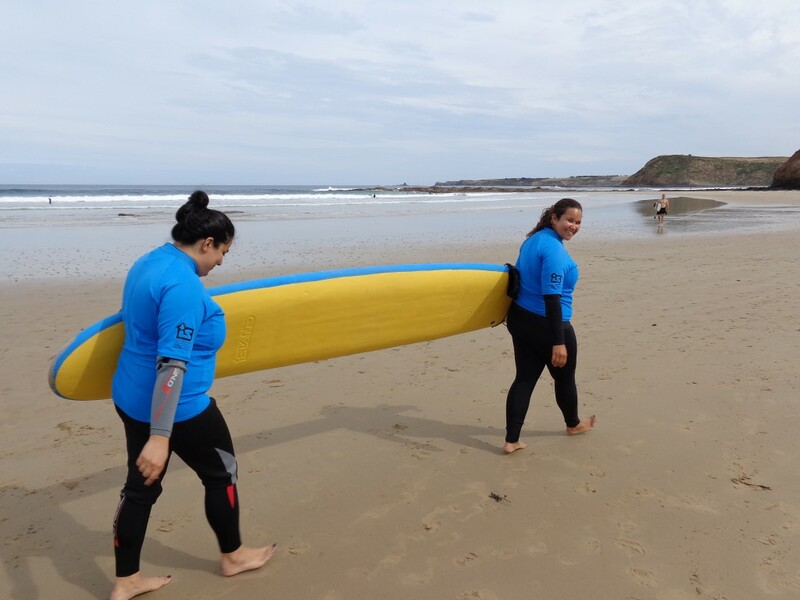 Finally, at thirty years old, in my turquoise dream destination, I signed up for an official surf lesson at Smiths Beach with Island Surfboards on the beautiful Phillip Island in Victoria. Shockingly, Island Surfboards had me catching waves in no time. Getting ready for our lesson with our camp shirts on! 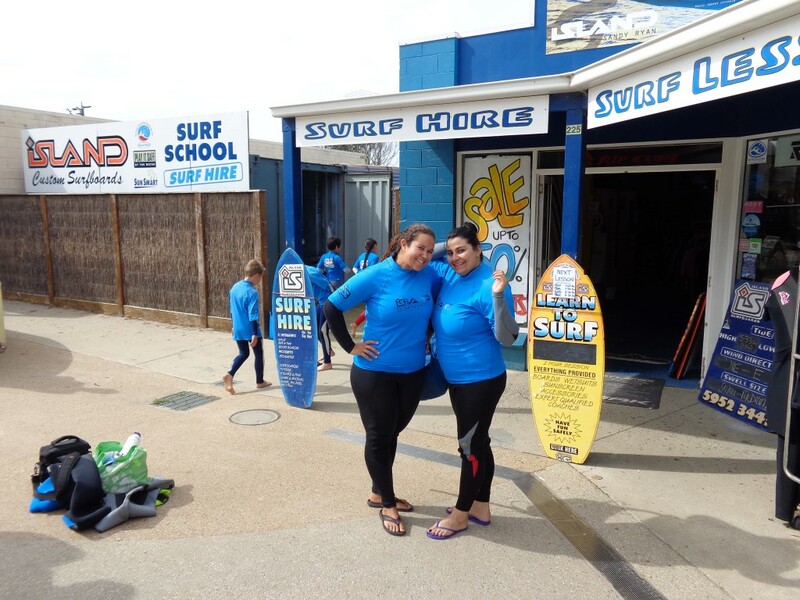 When Surf and Fitness Journey heard that I would be traveling to Australia and that I wanted to try surfing, she immediately recommended Island Surfboards on Phillip Island. 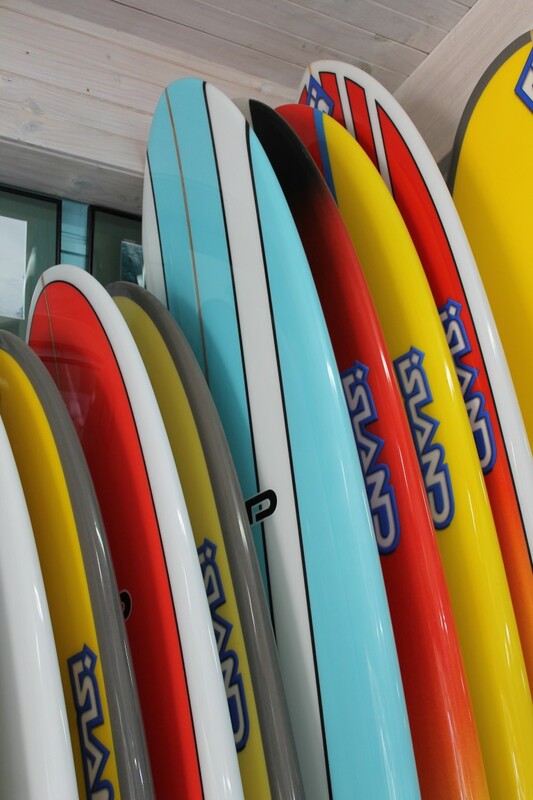 It’s Island Surfboards who actually taught Amy how to surf and got her hooked on surfing. 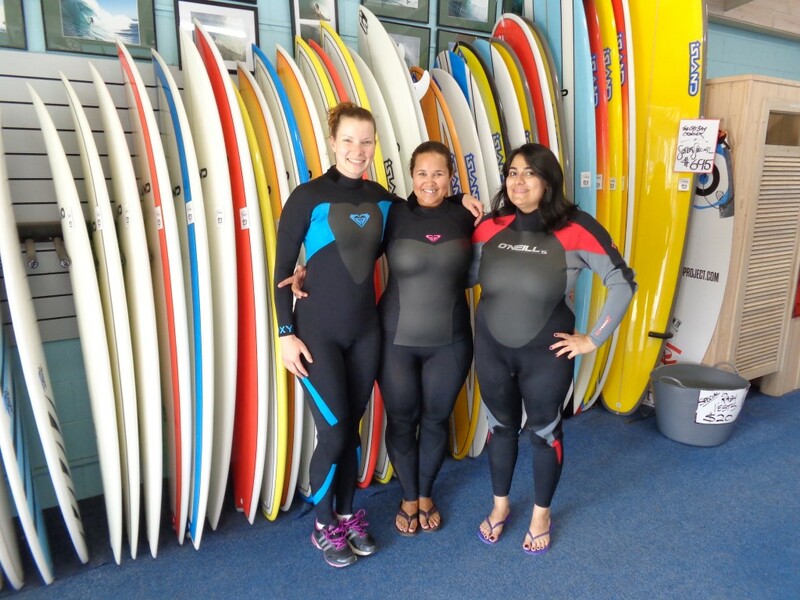 Now she writes about her surf and fitness journey on her blog. When I signed up for the lesson, Island Surfboards guaranteed me that I would stand up on my surfboard during my very first lesson. (They’re really that good!) I was skeptical and thought that it would never be possible, but I took them up on the offer. I had tried time and time again and failed over and over again. It’s frustrating when you want something so bad and you can’t achieve it in the way you think you should. Yet this time, standing up and surfing on a long board became possible over and over again. After the beach dry land training, I went out into the water to practice paddling and catching the whitewash waves. After I was comfortable and successful at catching wave after wave, now the hard part…standing up. We went back to the beach for the second part of the lesson. We learned the process and sequence on dry land of how to go from laying down, paddling, catching a wave, to standing up (without falling off). We drew surfboards in the sand and practiced the sequence to ingrain the process in our brains so that when we got into the water we remember what to do. The three lessons I learned to master standing up were: 1. think about what you are doing, 2. don’t rush and take your time (you have the time to react), and 3. It’s more mental than physical. Surfing is about teaching your body to react in a certain way. These tips were invaluable and prepared me to go out in the water and test the theory I learned on the beach. When I got into the water to actually practice all the knowledge I had learned, I was overwhelmed at first. Every wave that I was wasn’t successful on made me more and more frustrated. The children who were doing the lesson with me were quickly up and standing in no time. I’m not going to lie, I was slightly jealous, even as I happily cheered them on. I was still expecting surfing to come easily for me as someone who is a stronger swimmer and used to being in the waves. Growing up by the sea (and in the sea) has made me have a love for being in the water. Once I let my ego go, I had to really think about what I needed to do to catch a wave. After a few unsuccessful attempts, I slowed down my pace to follow the instructions step by step. Slowly and surely I was determined to catch a wave. During my time in the water, my instructor had to remind me a few times not to rush the standing up process. He gave me the guidance I needed, while still giving me the space to learn and explore on my own. Every few waves he would swim back to check in with me and to give me a few more pointers. There were times when I thought I would never stand up. Immediately falling off when trying to stand up on a wave is frustrating. Any surfer knows that fighting the whitewash waves out to sea is hard work. Surfing is exhausting. As much as I wanted to just give up and go suntan on the beach, I knew I would be disappointed in myself if I did that. In the end, all of my hard work and patience (or lack there of at times) paid off, because before I knew it (in less than an hour) I was standing up on the long board and surfing to shore. I couldn’t believe it! I actually surfed! Not just once, but four times that afternoon. Can I call myself a surfer girl now? Probably not, but I still surfed none the less and all thanks to Island Surfboards. I wouldn’t have been able to do it without them. They made all the difference for me, especially since I had tried a couple times before with no success. 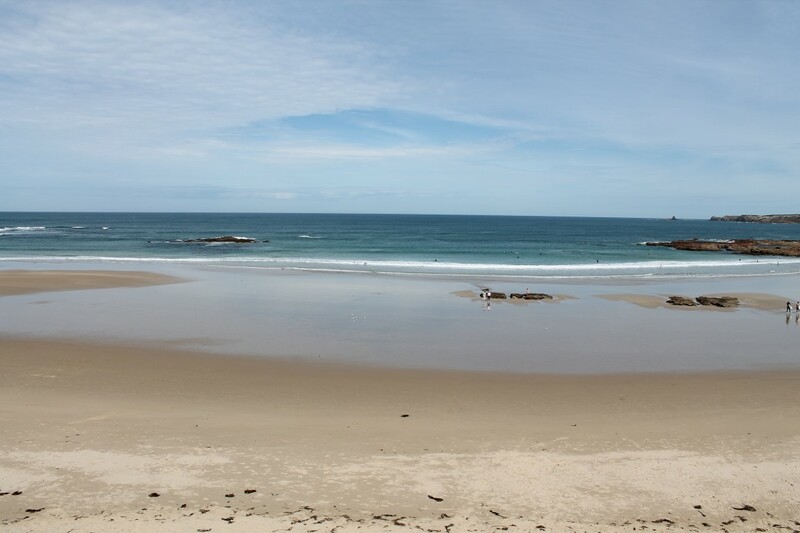 This entry was posted in Australia, Bucket List, Oceania, Reviews, travel, Turquoise Travel and tagged adventure, Australia, Beach, Bucket List, experiences, Island Surfboards, ocean, Phillip Island, South East Australia, Surf Lesson, Surfing, Travel, Turquoise, Turquoise Compass, VIctoria by Turquoise Compass. Bookmark the permalink. Yes we did. You too chica loca. How’s the warm water where you are? Finally, I can say I went surfing. Third time is a charm! Finally, after many almost fatal attempts, I can say I actually went surfing. I think you can surf in England too. You should really give it a go in Wales.